Why read Dickens? It’s kind of like comfort food with the same basic ingredients, but in a lot of different flavors – like flavored yogurt. Dickens is funny. He uses humor in everything from dialogue to character names and there are whole sections of simple tension relievers after cliff-hanger chapter endings. Dickens is long-winded and never passes up the opportunity to use a semi-colon to get the reader through, around and between all the words and clauses of one sentence. The introductory and descriptive passages in Oliver Twist are too wordy and heavily punctuated by thrice, but the low-life dialogue is great. Dickens is a sentimentalist. The pathetically poor good guys win and evil bad guys get their comeuppance. Sometimes a character will reform. Dickens doesn’t hesitate to use emotionally manipulative scenes to their smarmiest. The good kids read their Bibles, pray and cheerfully obey. They are also honest, hard working and uncomplaining although Oliver does cry a lot. Dickens’ adult characters are often well developed but without being really “rounded.” They are often simply interesting variations on a stereotype. In Oliver Twist we have Sikes, Fegin and some others as the bad guys and Brownlow the good – sometimes the apparently bad can have good hearts – they are often reformed. 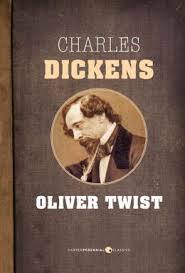 Dickens’ plots are very loosely predictable but quite imaginative in the specific. There is usually some major plot point like “Who is Oliver anyway?” which will carry many plot threads. A reader intuitively understands the picture on the wall is important to love and goodness winning out in the end. And it is also comforting to know that the evil bad guys who don’t reform are doomed. But the way from point A (dire straights) to point C (happily ever after) can be full of very imaginative surprises. The frequent coincidental happenings are amazing. Dickens may or may not be racist. I understand he changed his ways (to an extent) mid-stream in Oliver Twist and that was only his second novel. The first 38 chapters are loaded with negative references to Jews but the last 14 were edited because of a complaining letter. This is edifying because it tells us that the defense of “this was standard for the times” is not 100% accurate. Dickens will grow on you. Over time and exposure his novels of a different time and place have become a rather stress-free zone, a respite from the morally ambiguous 21st century. I enjoyed Bleak House, A Tale of Two Cities, Dombey and Son and Oliver Twist most – and in that order- just preference, I suppose. It took time to “get” him though – I don’t know why.